White Washed Paddles Wedding Guest Book Wall Decoration Set of 2 Personalized With Names / Wedding Date NEW! 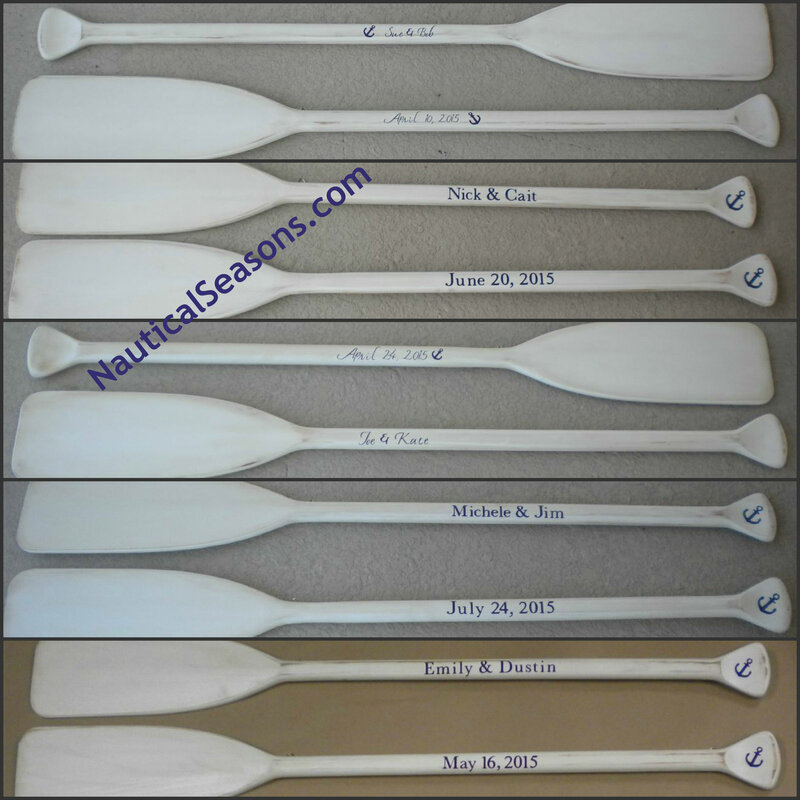 Click the button below to add the White Washed Paddles Wedding Guest Book Personalized Wedding to your wish list. Set of 2 nautical white washed wooden paddles, white washed rustic color made of hard-wood then finished with a rustic look with hand-sanded imperfections to add to the beauty of the product. 46" tall X 6" wide at the bottom of the paddle. Lettering on the handle is approx. 3/4'- 1". Our hand-made process on these paddles include: Sanding, painting, and stained by hand. We then add the custom lettering with premium quality vinyl, we use premium paints and stains for a quality finish. Perfect for a wedding present or use as a guest book for your wedding giving plenty of room for your guests to sign using a sharpie or paint marker. Lettering may be added to the paddle section as well. Each set of paddles will be slightly different due to the hand-crafted nature of the product, although we make every effort to make them as close as possible. Due to the custom nature of this product please allow 2-3 weeks for shipment. However, rush shipment may be available. THIS IS A SET OF 2. YOU WILL GET 2 PERSONALIZED PADDLES WITH THE WRITING OF YOUR CHOICE ON EACH PADDLE HANDLE. Also available in White Paint (Not distressed) Call for details. The bride was so excited to get these for the special day! Seller was so helpful and responded quickly to all questions. Shipping was fast and the oars were well packaged to avoid damage in shipping. Highly recommended seller and product!!! It is just as I had hoped for. Seller was very good about contacting me with questions about exactly what I was looking for.